Provide comfort for the family of Wanda Bzdell with a meaningful gesture of sympathy. It is with great sadness that we announce the passing of Wanda Bzdell, on March 18, 2019 at the age of 78. Left to mourn are her nephews. Ken Berkach (Val) of Prince Albert. Ben Berkach of Saskatoon. Great nieces Darby Lynne, Tanisha (Don) Berkach. Great nephew Terin Berktch of Prince Albert. Great, great nieces Aubree Ebbony of Prince Albert. Vienna, Mataia of Edmonton. Numerous cousins from Poland. Wanda was predeceased by her parents Mike Berkach and Julia (Pietras). Her brother Alec, her sister Helen. Her husband of 47 years, George Bzdell. Wanda was born in Kalyna District on July 27, 1940. She worked at the Metropolitan and Woolco stores in the payroll office. Wanda will be sadly missed by her many friends and family, Tracy Orleski who took care of her for the past 5 years. Wanda’s service will be held Saturday March 23, 2019 at 10:30AM at Sacred Heart Cathedral. 1401-4th Avenue West. Celebrated by Father Roque Concepcion. Internment to follow at Memorial Gardens in Prince Albert, SK. Donations can be made to donors’ choice. Arrangements in care of MacKenzie Chapel & Crematorium Brian and Bev Stobbs, Renée Phaneuf - Funeral Directors. www.MacKenzieChapel.ca 306.763.8488. To send flowers in memory of Wanda Eve Bzdell (Berkach), please visit our Heartfelt Sympathies Store. 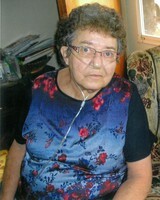 Provide comfort for the family of Wanda Eve Bzdell (Berkach) by sending flowers. My sincere condolences. I worked with Wanda at the Metropolitan Store in the 60's. We shared many good laughs and conversations together. May she rest in peace, after a life very well lived.